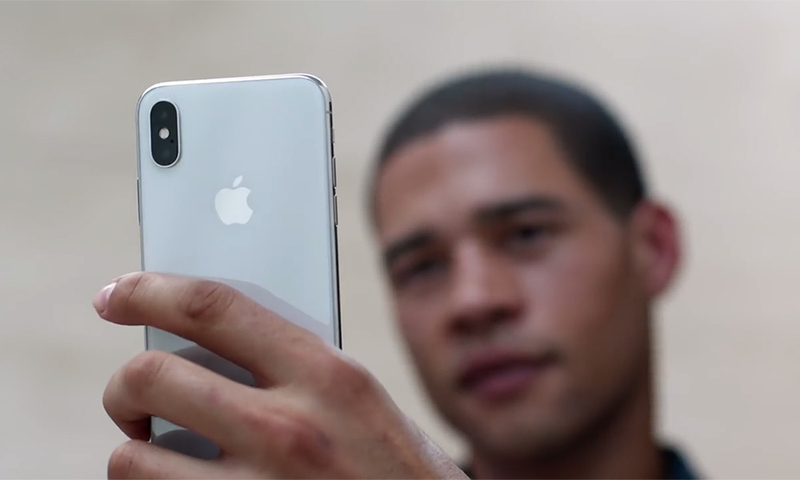 The iPhone X is the first Apple device to offer Face ID security to access your phone. Apple’s facial recognition process is a form of biometric authentication. Follow the tips below to set up and use this new feature to make the most of Face ID on the Apple iPhone X. The TrueDepth camera system measures the topography of your face using infrared dots of light. Face ID stores a mathematical representation of your face’s distinctive features. This process makes your phone secure so that no one can use your iPhone X except you. The map is stored in a secure part of the phone’s A11 Bionic chip. The phone only checks to see if your face matches the stored map. Your facial identification is never sent to Apple or any third party. To complete the Face ID enrollment, you need to follow a few steps before you can use it. Go to Settings and access Face ID & Passcode. The front-facing camera will turn on. Look at your phone with your eyes open. You’ll see your face displayed in a circle of green dashes. Follow the prompts to rotate your head in a full circle so that the camera can map your facial features. Tap continue, move your head in a circle again, and tap done. You’ll need to set up a passcode as a backup authentication method if you didn’t take that step previously. Return to Settings and access Face ID & Passcode to choose which apps to use with Face ID. You can also reset Face ID using your Face ID & Passcode settings if needed. Face ID replaces Touch ID on the iPhone X. While you can’t use your fingerprint to unlock the phone, a passcode will still work. Other users will also need the passcode to unlock the phone. Face ID works only with one face. For security purposes, the iPhone X Face ID feature isn’t always searching for your face. Use the Raise to Wake function or tap your phone to activate the Face ID function. Glance directly at your phone with your eyes open. When you see the lock icon change to unlock, swipe up from the bottom of the screen to unlock the phone. Shoppers who use Apple Pay can use Face ID for payment authentication. For in-store purchases, double-click the side button and glance at your phone. When prompted, hold the phone near the contactless reader. When you see the green done checkmark, you’re all set. To shop online, tap buy with Apple Pay at checkout and confirm your payment method and card. Click the side button and glance at your phone. Wait for the Done message and checkmark to display. Both iTunes and third-party apps that use Touch ID for authentication will now be able to use Face ID for authentication, too. Face ID can save battery power with a few different features. Face ID dims the screen when you look away from your phone. The facial recognition feature also lowers the volume on alerts when you are using the phone. You don’t need to use loud alerts when you have the phone in your hand. If you use the phone as an alarm clock, the alarm volume will go down as soon as you look at your phone. Quickly press the sleep and wake button five times to enter emergency mode. This mode disables Face ID so that no one can force you to open your phone. Only the Emergency SOS screen will show on your phone. From here, you can access your stored medical ID and emergency services information. Your iPhone X offers a more secure authentication process than previous iPhone releases. Apple reports that the chances of someone else being able to unlock your phone using Face ID are one in a million. Explore the iPhone X’s Face ID applications to make the most of this new feature.